After years of anticipating their release, it’s hard for me to believe that AMD’s Zen-based Ryzen CPUs only arrived a month ago. Frankly, I’ve never seen so much drama unfold so quickly in the tech community — what an exciting time to be a PC enthusiast! As we begin to recover from the roller coaster ride that was Ryzen 7, we now have Ryzen 5 to address. Getting the ball rolling, AMD has announced four models in its more affordable series, including a pair of six-core CPUs as well as two quad-core models. 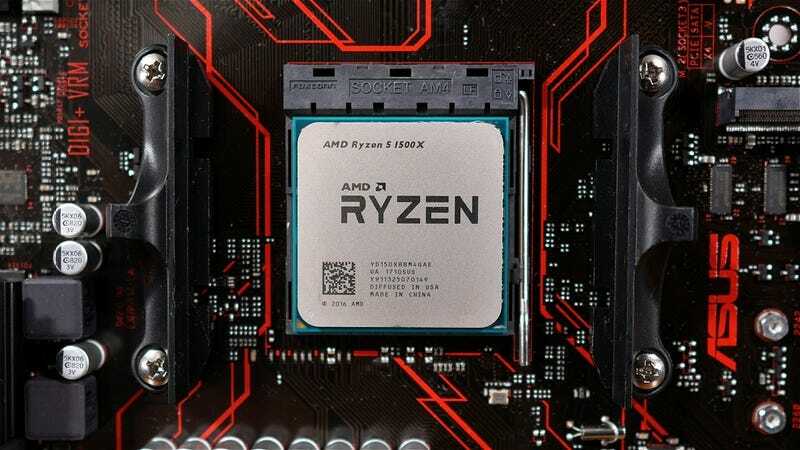 The 1600X is configured similarly to the Core i7-6800K and stands as the flagship of AMD’s Ryzen 5 family, boasting six cores and 12 threads with a base clock frequency of 3.6GHz and a boost speed of up to 4GHz. Like all Ryzen CPUs, the 1600X is unlocked, but we wouldn’t necessarily expect to squeeze much more out of the stock settings given what we’ve seen from Ryzen 7. AMD says the 1600X will be almost 70% faster than the Core i5-7600K when measuring multi-threaded performance in Cinebench, though that isn’t a huge surprise considering the Ryzen part has two more cores plus eight threads. Alongside the 1600X is a second six-core part known as the 1600, which comes downclocked by 400MHz but is nonetheless completely unlocked. As was the case when we reviewed the 1700X and 1700, it’s likely that the 1600 will be a much better buy than the 1600X. However, we only have the 1600X on hand for today’s testing. The 1500X and 1400 represent AMD’s new four-core/eight-thread Ryzen 5 parts and these come clocked even lower out of the box. The 1500X operates at a base clock of 3.5GHz with a boost of 3.7GHz and the 1400 runs at 3.2GHz but can boost to 3.4GHz (and again, both are unlocked). For those wondering, the 1500X and 1600 will ship with the Wraith Spire cooler while the 1400 comes with the smaller Wraith Stealth cooler. Unfortunately, we only have one quad-core model on hand for review and that’s the higher-clocked 1500X. Price-wise, the 1600X is set at $250 alongside the Core i5-7600K, though we suspect you may be better off buying the standard 1600 for $30 less at $220. Folks seeking a sub-$200 Ryzen 5 chip have the 1500X and 1400 to pick from at $190 and $170, prices that compete with lower-end (locked) Core i5s and higher-end Core i3s such as the $170 unlocked 7350K, which we know to be terrible value. By the way things look on paper, the Ryzen 5 1400 should have Intel’s entire Kaby Lake-based Core i3 range begging for mercy while the locked Core i5 models should be equally if not more rattled. In the first of what will likely be many write-ups about Ryzen 5, we’ll be pitting the 1500X against the locked Core i5-7500 and the 1600X against the unlocked 7600K. The Core i7-7700K, 6900K and 1800X will be included purely for comparison’s sake, and although we haven’t had time to add results for the six-core 6800K, we think it’s unnecessary anyway. Given Ryzen’s pricing scheme, Broadwell-E can be considered a write-off at this point. Memory bandwidth performance has improved for the Ryzen CPUs using the most up to date BIOS on the Asus B350 motherboard. AMD’s chips are now good for 35GB/s whereas we were previously seeing around 32GB/s with DDR4-2933 memory. Even with lower rated memory, Ryzen CPUs are delivering at least 10% more bandwidth than the Kaby Lake CPUs. This will hand the 1500X a massive advantage over the Core i5-7500 in memory-intensive workloads as it has over 40% more bandwidth at its disposal. Using Cinebench R15 to measure single and multi-threaded performance we once again find extremely impressive figures from the Ryzen CPUs. The 1600X lays waste to the 7600K’s multi-threaded score, essentially doubling it. That said, for single-threaded workloads, the higher memory clock speed of the Core i5 results in the 1600X being 11% slower here. Moving to the 1500X, we find it’s just 15% slower than the 7700K in the multi-threaded test and 21% slower when looking at single-thread performance. However, when compared to the similarly priced 7600, the 1600X offered 45% faster multi-threaded performance and 6% faster when looking at single-thread. As we found when testing Ryzen 7, this points to Ryzen 5 offering vastly superior productivity performance compared to competing Intel CPUs. The 7-Zip benchmark shows similar margins to what we just saw in Cinebench R15, though this is a real-world application and the gains here can actually be enjoyed by the average user. There are two tests here: one measures the performance when compressing files to an archive and another measures performance when extracting an archive. It’s interesting to note that Intel’s compression and decompression performance is similar. The AMD CPUs are much faster at decompression than they are compression, though to be fair they are anything but slow at either. In fact, the 1600X crushes the 7700K in both tests, being 15% faster when compressing and 44% faster when decompressing. When compared to the 7600K, the 1600X is more than twice as fast when decompressing. Meanwhile, the 1500X is over 60% faster than the 7500 in our decompression test, which is a massive difference and the vast majority of users will open archives more commonly than they will compress them so this is a big win for Ryzen. The Monte Carlo simulation is an old favorite and this heavy Excel workload crushes weak CPUs. It’s also a great test for measuring multi-threaded performance as it uses all available threads. We’ve seen it do a good job of utilizing a dual-Xeon configuration with 40-threads. I realize most of you are more interested in gaming performance than heavy spreadsheet work but this is a good indicator of real-world performance in applications that utilize multiple threads. Here we see that the 1600X is 10% faster than the 7700K and 62% faster than the 7600K, while the 1500X was 20% slower than the 7700K but 18% faster than the 7600K and 61% faster than the 7500. So when compared to similarly priced Intel CPUs, Ryzen 5 delivers around 60% more performance in this application. Before jumping to the game benches, let’s check out the performance results from Premiere Pro CC. This is a different workload from our previous Premiere tests. It’s still a 4K video export, but we reduced the video length to speed up the test. The 1600X took 241 seconds to complete the workload, which was 31% faster than the Core i5-7600K, while the 1500X managed to match the 7600K and overtake the 7500 by 22% — another excellent application result for AMD. Testing games is where things tend to get tricky. In Battlefield 1, the 1800X and 1600X fall short of the 7600K’s 153fps average, but if we look at the minimum frame rates they’re both faster than the 7600K. In fact, when comparing minimum results, the 1800X matched the 6900K while the 1500X was just 4% slower. The 1500X on the other hand loses out to the Core i5-7500 in both the minimum and average frame rates, though it’s still possible to overclock the 1500X for greater performance and we will explore this later in the review. Deus Ex: Mankind Divided was tested using the DX11 API at 1080p with the high quality preset. Here the 1600X matches the performance of the 1800X though unfortunately both are slower than the 7600K by almost 10% when comparing the minimum frame rate. That said, the 1500X makes out quite a bit better, beating the locked 7500 by a slim margin. The DX11 Hitman results are quite competitive for the 1600X and 1500X which is great as the 1800X doesn’t fare that well against the 7700K or 6900K, at least when looking at the average frame rate, though I should note the minimum result is good. Moving on, the 1600X roughly matched the 7600K while the 1500X was a good bit faster than the 7500 — a great result for the 1500X here. The plan was to include Mafia III to showcase how well Ryzen can perform in some games. Previously this was a title where the Ryzen 7 processors did well, even beating the 7700K under certain conditions. However, this retest shows the 1800X quite a long way behind the 7700K. Something has changed with this title. The 1800X has taken a big hit, particularly to the minimum frame rate and the same is also true for the 6900K. Conversely, the 7700K has gained a few extra frames, so it seems some optimization might have been done to make this title less demanding on the CPU. This could also be down to improvements made by the Nvidia display driver. I believe the game was patched last week but there was no mention of any performance changes. The Nvidia driver has also been heavily updated since they previous testing was conducted but the improvements mostly focused on DX12 performance. I expected the 1600X to easily beat the 7600K here and the 1500X demolish the 7500. Instead, performance is competitive among these processors and again something has changed here. Moving to Ashes of the Singularity we see that the 1800X is able to close in on the 7700K for the normal batch test, that said it does slip away in the heavy batch test. The new Ryzen 5 models look rather competitive when comparing the 1600X to the 7600K and the 1500X against the 7500. The latter chips are separated by almost 10% in the normal batch test — yet another strong result for AMD’s affordable quad-core CPU.